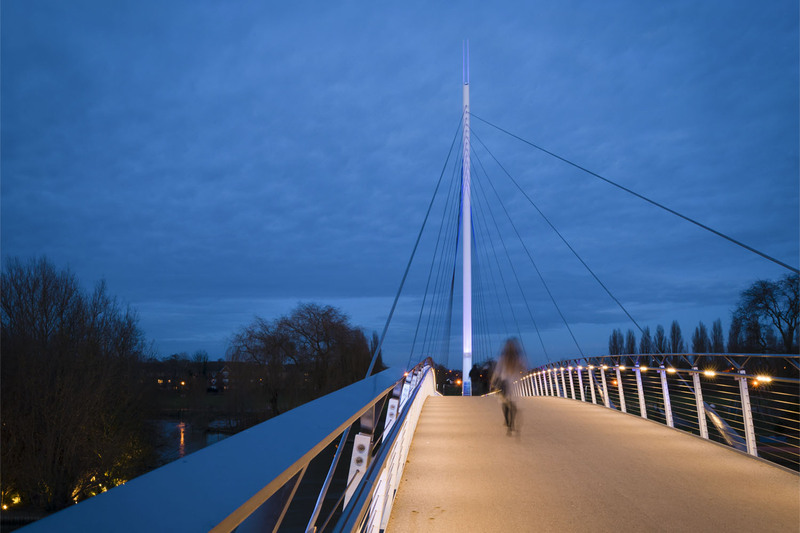 An important new link for pedestrians and cyclists around Reading Town. 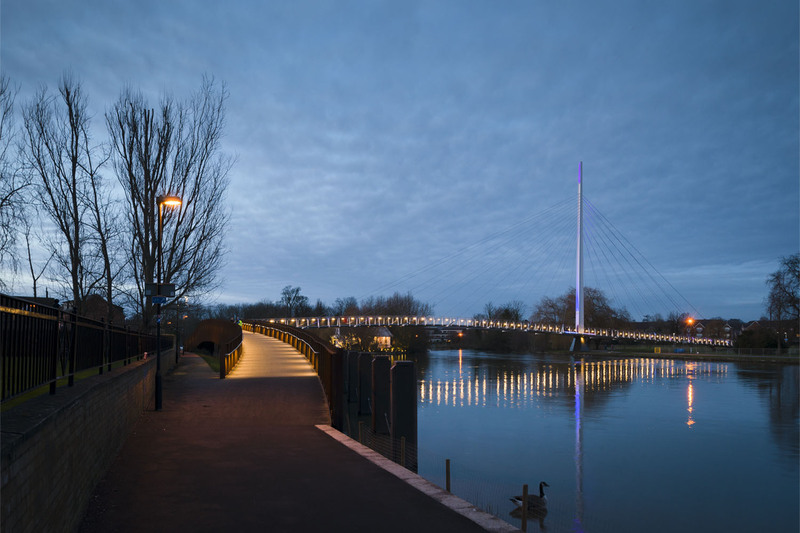 Designed in collaboration with engineers Peter Brett Associates, the new bridge provides an important new link for pedestrians and cyclists between Reading Town Centre, the upgraded rail station and Caversham’s riverside areas, considered key to the overall spatial strategy for Central Reading. 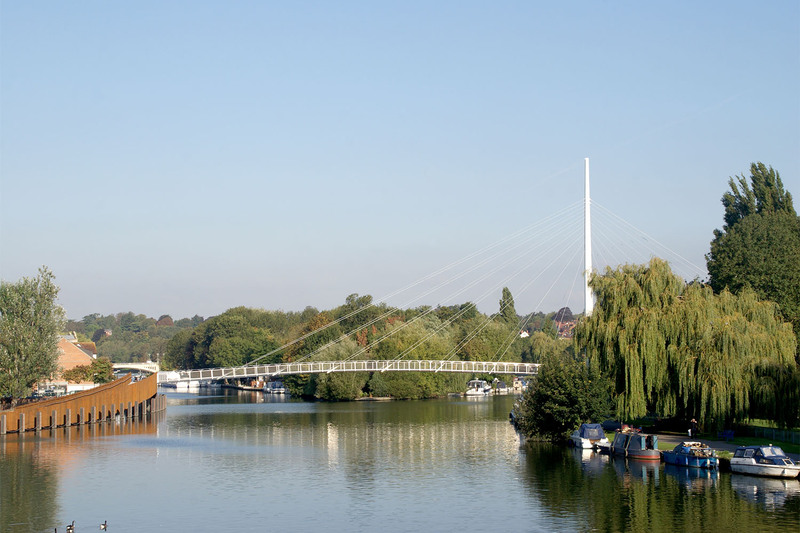 The location of the new bridge is just to the north of Reading Town Centre, between Fry’s Island and Reading Bridge. The area to the south west mostly consists of two storey Victorian terraced houses with some taller residential blocks facing onto the river. The area to the southeast comprises of office buildings rising to four and five storeys. In contrast Christchuch Meadows to the north comprises of open space laid out as playing fields. Pedestrian and cycle paths cross the grassed areas with a route along the side of the river, forming part of National Cycle Network Route 5. 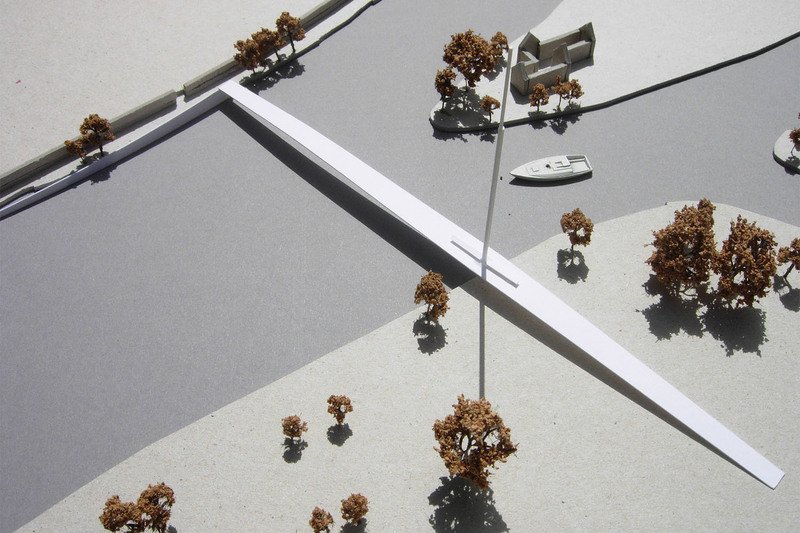 The design also had to permit future adaptation to allow a new southern approach ramp to be formed through to Vastern Road and onwards to the train station and the town centre through the Southern Electrical substation site. The location and alignment of the bridge followed a rigorous options appraisal process that took into account environmental, aesthetic and amenity impacts.The confined site on the South Bank and the possibility of future extension to allow direct access to the Town Centre led to a two-part solution, the first part being the main bridge span across the river and the second being the ramp and stair on the Southern side. To maintain the purity of the bridge span these were conceived as two separate elements both structurally and visually. A single masted cable stayed structure was developed for the principal river span due to its lightness of appearance, value for money, deliverability (including ease of construction), and clear navigation width. 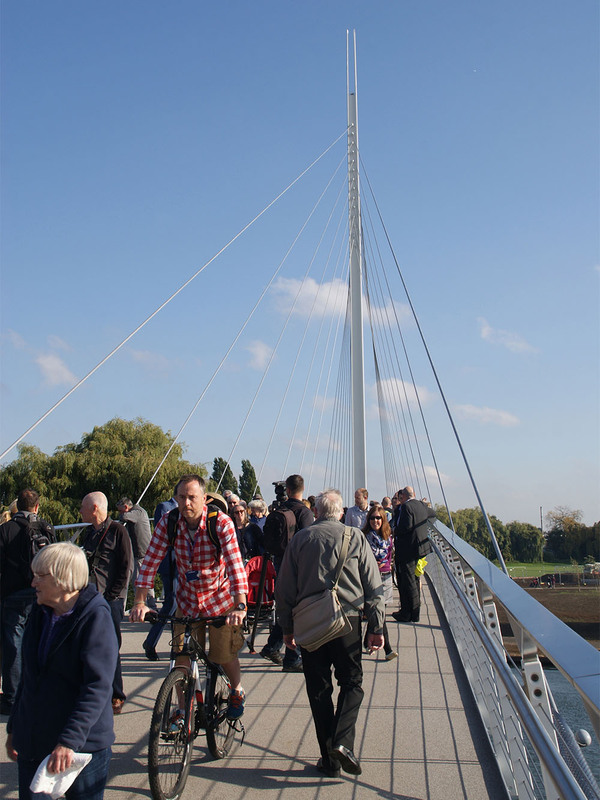 The structure creates a river span of 68m and a land span of 54m supported by a mast of 39m height located above the north bank of the River Thames. 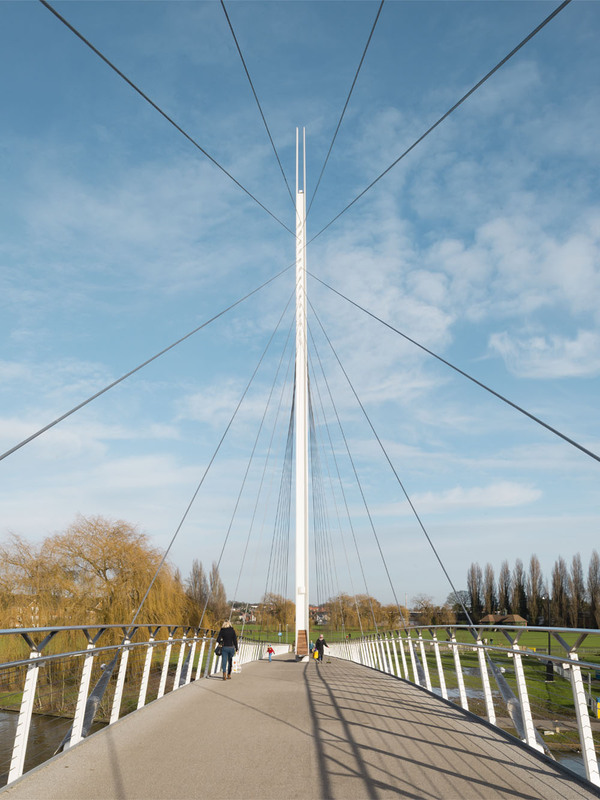 The single slender mast was positioned on the north bank with the land span continuing straight on into Christchurch Meadows to balance the river span visually and structurally. 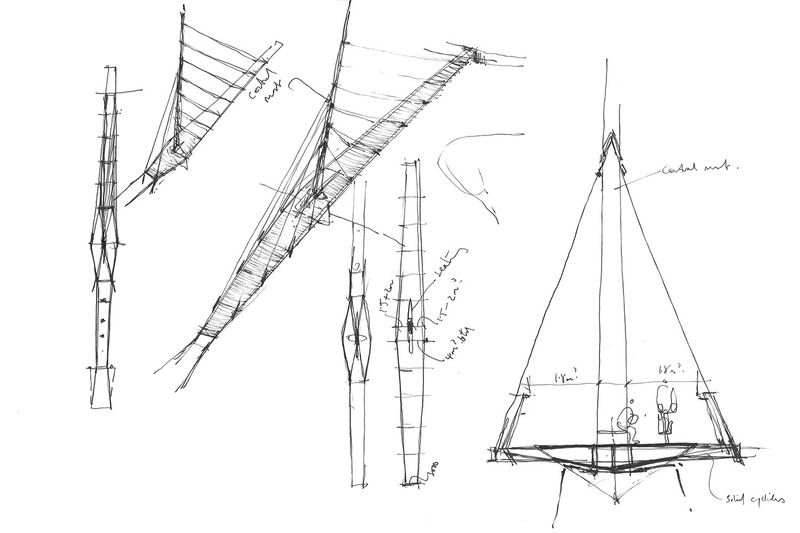 The slenderness of the mast is reinforced further by continuing the two side elements of the main mast structure beyond the line of the last cable, creating a crowning or tuning fork effect, allowing sky to be seen through the mast top. The bridge deck gently tapers from its widest point around the mast towards either end. A timber-clad bench folds out of the mast at this point offering panoramic views of the river and the meadows beyond. A continuous handrail provides the lighting for the bridge as well as a convenient place to lean on while enjoying the new views opened up by the bridge. 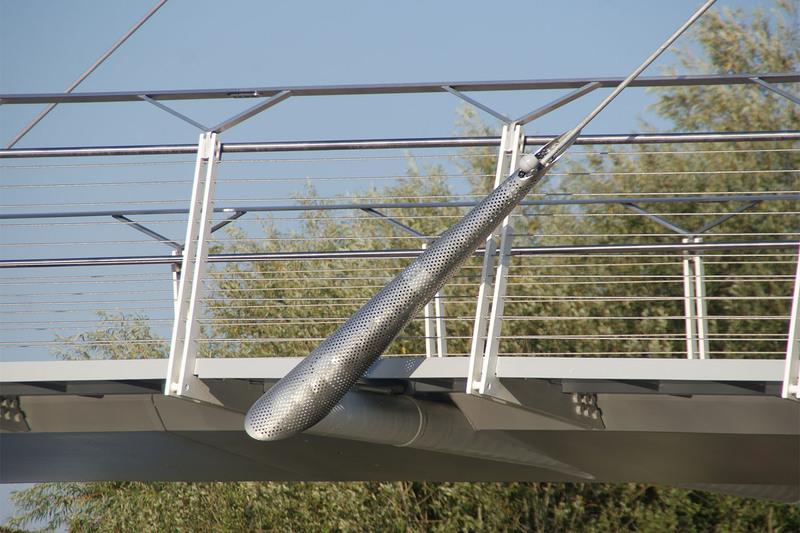 Conical cable shrouds fabricated in perforated stainless steel wrap around each of the cables as they connect to the bridge deck. The perforations will allowing a small amount of light to fall through the shrouds containing small colour changing spot lights which will highlight the cables at night. Even though the bridge is the key structural component it has been necessary to develop a different approach to how the bridge deck meets the southern towpath. Unlike the northern side of the river, the south side has very restricted access resulting in the need to create a staircase and ramp at 90 degrees to the bridge direction. It was considered important that due to the relationship between the single mast and the bridge deck that the overall impression is that the bridge is in balance. These two elements were therefore treated as a separate entity. The ramp and stair structure sit within the River Thames in order to ensure clear access along the existing towpath. A gentle curve to the ramp and stair gives a breathing space between the new structure and the towpath that increases as the structure rises to meet the bridge, helping to avoid the towpath being oppressed by the taller ramp. 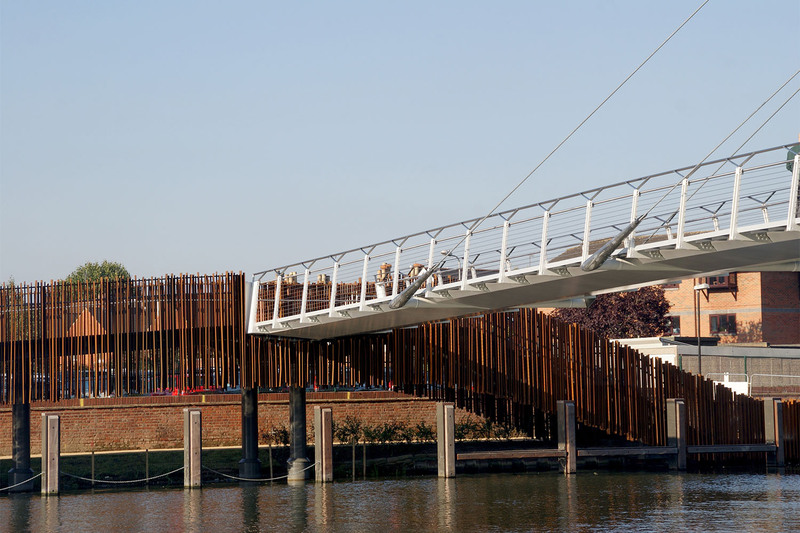 The balustrading to the ramp is formed from a series of random vertical bars at different angles to echo the natural reed banks which form part of the river edge along this part of the Thames. Fabricated from weathering steel and integrated into the new planting, the ramp and stair will mature naturally into the environment.